The photos above illustrate some of the fantastic events and competitions that are a result of the continuous hard work from the Irish Branch. 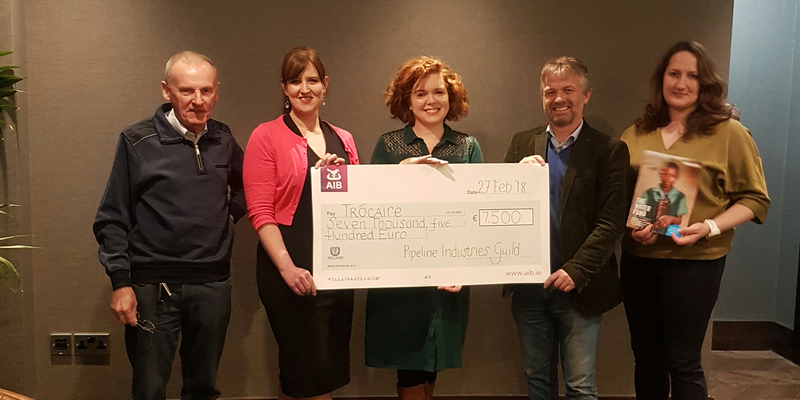 Irish Branch Dinner | February 2018 - The prestigeous Irish Branch Dinner held at the Conrad Hotel with €7,500 raised for Trocaire. The Irish Branch covers the full extent of the Republic of Ireland and it collaborates closely with the Northern Ireland Branch. The main activities, which are centred around the winter/spring period, are a series of technical evenings at which a variety of interesting papers from various sectors of the industry are presented. The Annual Dinner which usually takes place in February, has raised an incredible amount of money for various charities in recent years, most recently the 2018 dinner raised €7,500 for Trocaire in support of their Water Fund Project There is an annual Golf day where the Irish and Northern Irish Branches compete - currently the Irish Branch holds the honour as champions. The Branch is looking at initiatives to support the education of up and coming pipeline professionals and is constantly seeking to attract new members with particular emphasis on the younger sector of the industry. If you would like to get involved with the Irish committee please contact Marian Regan directly or HQ. Marian is a chartered engineer and project manager and has been involved with the Irish Branch for over 12 years. She’s also on the Board of Examiner of Engineers Ireland, a Board Member of UCD Engineering Graduates Association.